Winterthur was once the family home of Henry Francis du Pont. An important collector of American antiques, du Pont also amassed an important collection of rugs and was an honorary member of the Hajji Baba Club. Important scholars, such as May Beattie, Jon Thompson, and Walter Denny have visited and studied the collection. This visit will include a lecture by Linda Eaton, John L. & Marjorie P. McGraw Director of Collections and Senior Curator of Textiles, on the history of the collection before a private 2-hour special tour of the house, as well as selected rugs that are normally kept in storage. Visitors will also have the opportunity to see the gardens and galleries. Winterthur’s unparalleled collection of nearly 90,000 objects features decorative and fine arts made or used in America from 1630 to 1860. The house itself comprises 175 rooms, many of them with historical architecture, and is furnished with Mr du Pont’s outstanding collection of antiques and objects added since his death. Of particular interest to Hajji members will be the Textiles and Needlework Collection. 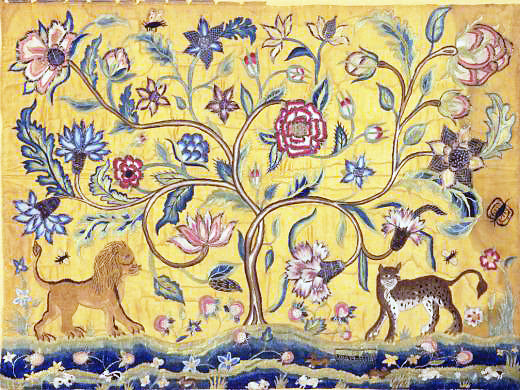 Textiles were one of Henry Francis du Pont’s first loves. From quilts to gowns, needlework pictures to bedcovers, Winterthur has some of the finest works of textile art made or used in America.